I sort of forgot about this Cheap Monday dress until I was going through my Instagram photos last night and saw it on one of my snaps. I'd hastily shoved it in a drawer under my bed to "tidy up"and it got forgotten about. I pulled it out to wear today and forgot how easy and comfortable it is to wear. I think black and white stripes are my favourite pattern, just so simple and cute. 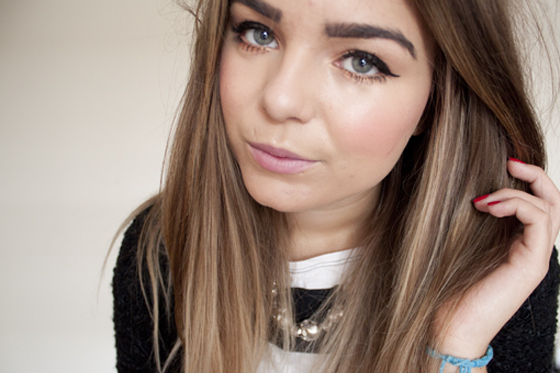 I'm off to a Clarin's event tonight (yayyy get to see blogger friends! ), Then possibly go out for dinner. I'm absolutely craving sushi at the moment! I think I'm also going to pop to Oxford Street and return the things I've decided not to keep from my Not a Haul Video. My two week rule is up so everything I've not worn so far is going back to store! I'm trying to be strict with this rule, but I know if I don't wear something in the first two or so weeks Im really not going to wear it in the future! Also, I'm determined to wear my Alvin's in so Im willingly torturing myself by wearing them again today! Oh well! seriously need to get those shoes!! love the beanie!! Black and white stripes are my favourite pattern too :) Feel like I haven't been out of them for the past week! This is such a great outfit. Shoes are amazing too. I am definitely loving the black & white look! ps. 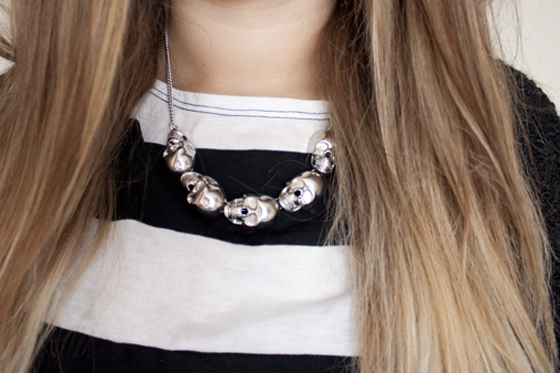 enter my brand new international jewellery/accessories giveaway! you have a chance to win one of two prizes! Oh those booots! They are overwhelmingly beautiful. I love the idea of the two week rule! It is true that if it isn't worn in the first two weeks, it probably will never be worn. If only I could hold myself to this rule! Your hair is looking absolutely fantastic lately! 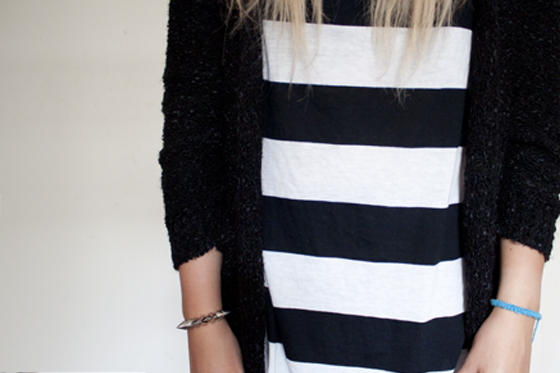 Black and white stripes are my favourite pattern too- my wardrobe is practically one big stipey mess! I'm a massive fan of anything black and white striped so I think this outfit is fab! Love the Alvin's, kind of need them in my life. Have fun at Clarins! Simple but nice. P.S. I love the red nails. The ankle boots and beanie are gorgeous!! Great dress and how gorgeous are these shoes! i saw a similar pair in zara. Cheap Monday has got to be my favourite brand atm! Just done a post about a grey maxi! I think I need to apply your 2 week rule to myself! So many clothes with labels on in my cupboard..
Love this! Those boots look great! I'm sure they'll be worth the pain.. hopefully! I love your rule, good way to try things out but then not get carried away. 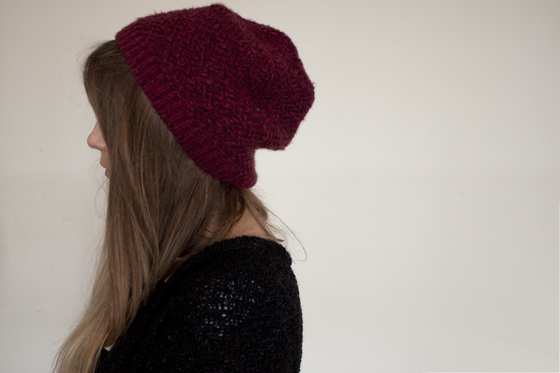 Cute beanie. And I really like your rule. Maybe I should apply that to myself. That's a great rule - I'll have to start using it too! Great rule and lovely spike bracelet. 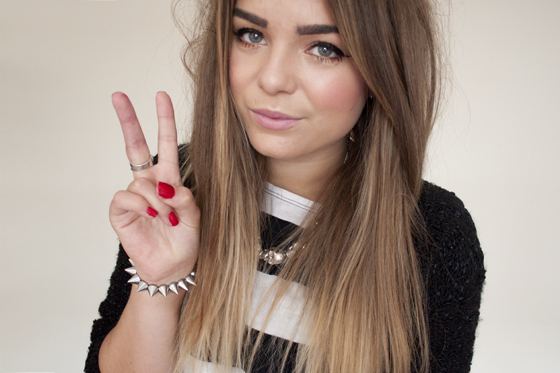 your red nails look amazing with your black and white outfit. Basic always works so well. always love a black and white outfit!! !